JOINT BASE SAN ANTONIO, Texas (Nov. 5, 2015) -- Army Chief of Staff Gen. Mark A. Milley visited with wounded service members during a town hall-style meeting yesterday at the Center for the Intrepid, or CFI. Milley started the town hall by outlining his priorities. 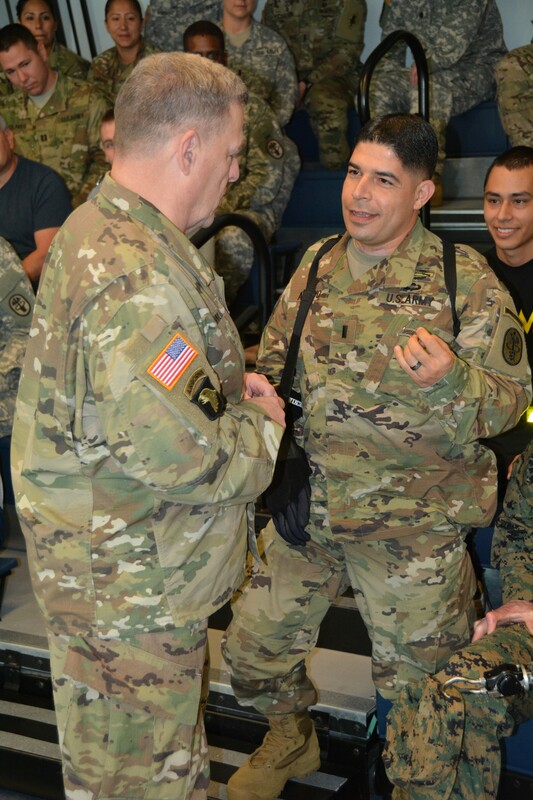 He explained that his first priority was readiness of the force, because the U.S. Army is still actively engaged in combat operations around the world. "Readiness is the number one priority of the United States Army," Milley said. "The second priority is the future of the U.S. Army, 25 to 30 years from now." The third priority, the general said, was not in order of importance, but is "always a priority." "Readiness is your current operation, the future of the force is your future operation and your always operation is to take care of troops and their Families," Milley said. "It's that third category that I want to talk to you all about," he told the audience. Milley said he was committed to making sure Soldiers, their Families and civilians are taken care of, not just while on active duty but for life. "It is my goal that we fulfill that commitment to those who have raised their right hand to serve," he said. "One of the most important things people in the military have come to expect and deserve is quality medical care." Milley encouraged all the service members to ask questions. Retired Col. Stanley Thomas, a current patient at the CFI, asked about future funding and support for the center. "I want to make sure that our troops are taken care of - period, regardless of cost," Milley assured, adding that he can't predict the future but at some point, we are likely to engage in more conflicts around the world. "As chief of staff of the Army, I need to make sure that places like this continue to operate," he said, stressing his commitment to ongoing support. Milley expressed his awe of the entire military medical system and the ability to save lives on the battlefield. "I'm not going to waste good efforts and lessons learned in the last 15 years of combat. 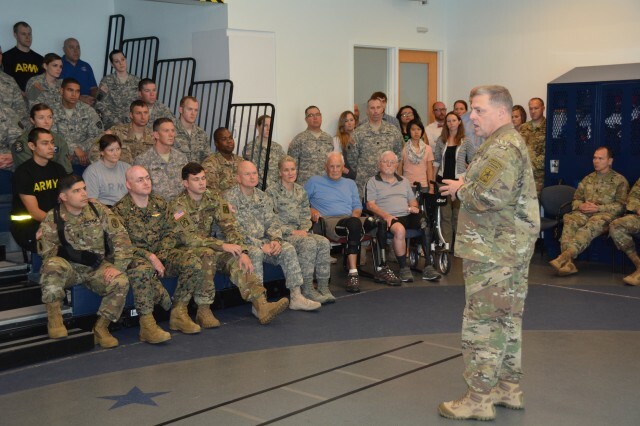 Military medicine is really on the leading edge of so many advances in medicine," Milley said. Service members asked a variety of questions including the length and frequency of future deployments and the ability to stay in the military after being injured. 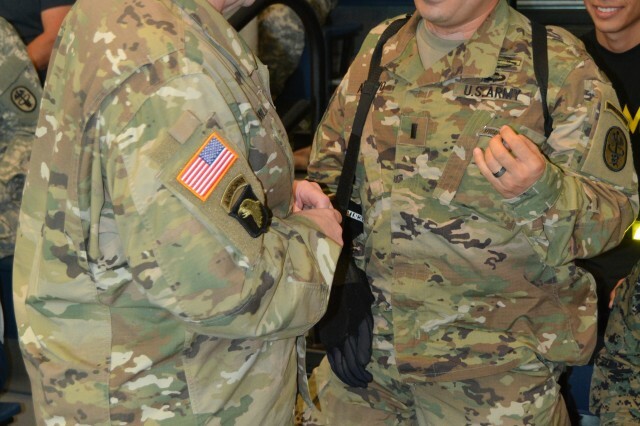 He handed several service members business cards with his contact information so they could contact him personally with their questions and concerns. Before Milley left, Air Force veteran Colton Read, a double amputee, wanted to make sure the Army's chief of staff understood how much the CFI helped him during his recovery. "Personally I have been here since 2009 and I just want to tell you how important this place is," Read said. "Being able to come back here after being retired … I know it's beneficial for a lot of guys to come back here after some time has passed, so we can do it for ourselves and become more successful."